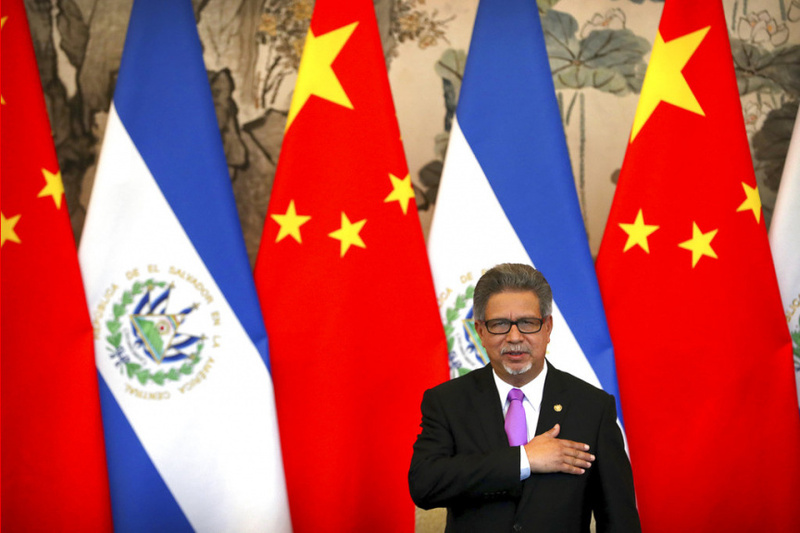 "History will prove that establishing diplomatic relations with China is in full accordance with the fundamental and long-term interests of the country and the people of El Salvador," Wang said. Taiwan split from mainland China amid civil war in 1949, and Beijing, which considers Taiwan its territory, campaigns relentlessly to isolate the island globally. It cut off relations with Taiwanese President Tsai Ing-wen's government shortly after she took office in 2016 and has been steadily ratcheting up both diplomatic and economic pressure. Earlier this year, the West African nation of Burkina Faso and the Dominican Republic broke ties with Taiwan and resumed or established diplomatic relations with China. Taiwanese Foreign Minister Joseph Wu on Tuesday condemned what he called China's campaign of luring away Taiwan's allies with promises of vast financial aid and investment. Taiwan is willing to consider cooperating with its allies in education, farming or even infrastructure initiatives, Wu said, but refuses to compete with China in buying diplomatic support. Wu said that El Salvador had repeatedly sought large amounts of funding from Taiwan for a port project that a Taiwanese team of engineers dispatched by the government thought wasn't economically feasible. "We think this is an inappropriate development plan that risks causing both countries to fall into great debt," Wu said, noting that some developing countries were increasingly concerned about the risks of unsustainable debt linked to Chinese investments. Wu said El Salvador's ruling party was also expecting Taiwan to provide funds to help it win in elections, but Taiwan refused. "It is irresponsible to engage in financial aid diplomacy or compete with China in cash, or even in providing illegal political money," Wu said. "My government is unwilling to and cannot do so." Some analysts say Chinese President Xi Jinping, one of the most powerful Chinese leaders in decades, seems determined to bring Taiwan under Beijing's control during his time in office, which would place him in the history books alongside Mao Zedong. The island's 23 million residents are strongly in favor of maintaining their de facto independent status, but Xi has previously warned a Taiwanese envoy that the issue of unification cannot be put off indefinitely. Salvadoran President Salvador Sanchez Ceren said on national television that China and El Salvador would discuss ways to cooperate in trade, investment and infrastructure development. "It will give great benefits to the country and provide extraordinary opportunities on a personal level to each one of you," he said. The move comes just a day after China's foreign ministry said it had complained to the U.S. over Taiwanese President Tsai's visits this month to Los Angeles and Houston while in transit to diplomatic allies Paraguay and Belize. The administration of President Donald Trump has been boosting relations with Taiwan amid a brewing trade war with Beijing. Tsai urged the island's people to unite despite the pressure the government was facing diplomatically. "Taiwan will not yield because of pressure," Tsai said in a televised address. "We will be stronger and more united, and this will strengthen Taiwan's determination to go out." Marcos Aleman in San Salvador, El Salvador, contributed to this report.